Goat leather on the outside, with reinforcements on the palm in veal leather and Thinsulate padding. Plastic protections on fingers and knuckles and high density rubber on back of the hand. 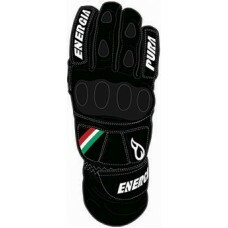 Giant leather glove , waterproof and breathable, specifically studied for racing. Made with goat leather (which is the leather that offers the best connection between thickness and resistance), the palm and the internal part of the fingers are covered with veal leather, which is waterproof and softer that goat leather. Anatomic shape, fitting and grip were studied with particular care, to guarantee comfort and effective protection even for a prolonged use.